Whether your small business has existed for years, or just recently started up, finding the most effective marketing strategies is critical. That’s because small businesses don’t have the same resources to execute as larger scale firms. In fact, you may be the founder and CEO who has also taken up the mantle of marketer. That’s why Sprout Social worked with our amazing partners at HubSpot, Animoto and Campaign Monitor to put together this guide to small business marketing. Would you rather have your customers searching for you instead of the other way around? Look no further than inbound marketing. In this section, HubSpot discusses the importance of inbound marketing for small business, the basics of getting started and how to choose the right channels for your organization. Let’s talk about a framework for bringing the ideal customer to your website. It’s used by tons of businesses, big and small, and it can work for you as well. One quick definition we at HubSpot use is to think of outbound marketing as “push” marketing and inbound marketing as “pull.” Rather than interrupt customers with disruptive ads or unethical sales tactics, you attract them via valuable content that helps them accomplish their goals. You attract prospects and customers to your website and blog through relevant and helpful content. Once they arrive, you engage with them using conversational tools like email and chat and by promising continued value. Finally, you delight them by continuing to act as an empathetic advisor and expert. 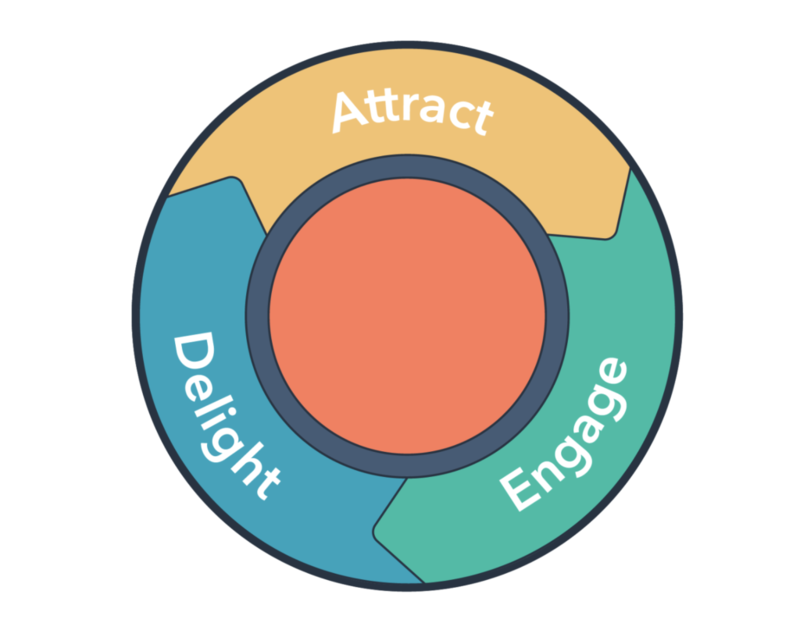 The inbound methodology isn’t specific to marketing, by the way. The same process and mindset can be used in sales and services, too. So, how do you actually do inbound marketing? There have been many books and courses on inbound marketing, so we won’t be able to comprehensively cover the idea here. Rather, we’ll give the 80/20 so you can start to take action. After you get your wheels on the ground, you can always go back and learn more about the methodology. 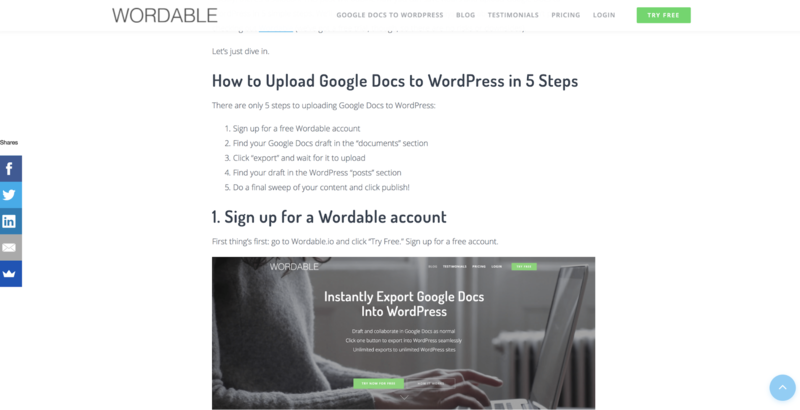 So what are the basic steps for getting started? First, map out your ideal audience, aka your target market. Who do you want to sell to? Second, map out the channels you can use to attract, engage and delight your customers. Where do they hang out and how do they communicate? Finally, begin crafting content and messaging that will be used to attract, engage and delight customers. Make sure you have analytics in place, because you’ll need to constantly learn and update your strategy based on the results you get. Let’s dive into each one of these individually. It’s possible you know your target market and have already built your buyer personas, but even if that’s the case, it never hurts doing this work again and learning more about your customers. The more you know about your customer, the better you can craft your messaging and strategy. In defining a target market, you narrow down your audience to the level that you can choose correct marketing channels and start to define a buyer persona for messaging. In building a buyer persona, you create a representative model of your prototypical customer. As in machine learning, you need to split the difference between perfect accuracy and perfect utility. In other words, you should gather enough data and information to make a buyer persona largely accurate to the real world, but you shouldn’t gather too much information and make it too complex. What are their motivations and fears? How do they prefer to make purchases? How much research do they do and what kind of content is useful to them? 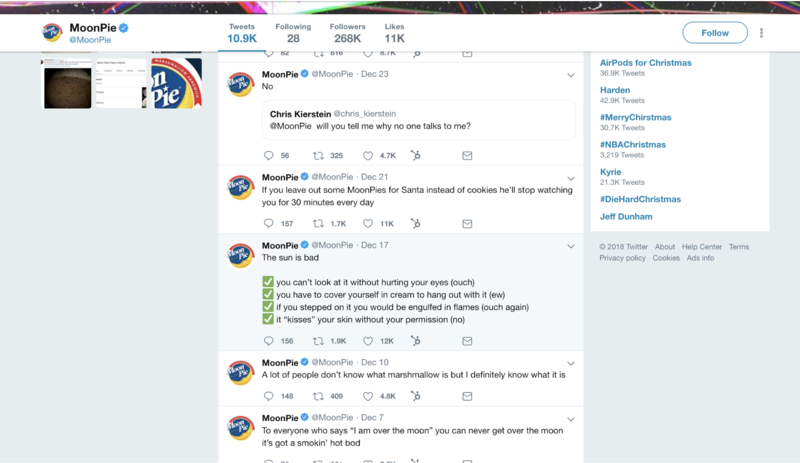 How do they interact with brands? What do they prefer the relationship to look like? Who do they look to when they’re making decisions? Who influences them? Where do they hang out? How can you reach them? All of these things will help you a) choose channels and b) craft messaging. Just don’t create a silly made-up buyer persona with a cute name just to go through the motions. Also, it probably doesn’t matter what your buyer persona’s favorite color of car is unless you’re selling paint or used vehicles. Stick to the stuff that’s important and knowable. Some channels won’t work for your business no matter how hard you try. For example, virality probably doesn’t make sense if you sell dish soap. Similarly, some channels could potentially work but will take so much effort and risk to pull off, that you should probably table them for the time being in favor of higher impact channels. For example, if you’re a LawnStarter (lawn care) or ProTranslating (translation services), social media may not pay off. In the case of lawn care, it’s usually when their lawn grows too long and they need someone right away. SEO and search ads are perfect to capture this type of demand. Some products, such as Chubbies or Airpods, are naturally viral. Just optimize the viral components and add a little wind to the sail. Others make a perfect fit for content marketing, such as B2B software companies like Wordable or Mutiny. These products tend to require a little bit of upfront education, and their target customers are accustomed to learning via blogs, webinars and ebooks. In any case, just think about it and discuss with your colleagues before jumping into a channel. Don’t simply join a channel because your competitors have or because it’s new and buzzworthy. We don’t need more gurus or businesses trying to make it big on Snapchat, and we especially don’t need more businesses trying to go viral on Reddit. Do what makes sense for you. Any inbound channel—nay, any marketing channel—will require some sort of messaging strategy. How you execute on messaging will largely determine how effective the channel becomes. Let’s say, for example, we want to use blogging and SEO as our inbound channel. This usually forms the basis of such efforts, as it’s an owned channel, and you can generally compete with very large players and win some or much of the time on quality and 10x content. Now, what do you blog about? While you can answer this question many ways with some degree of validity, we like to follow the Pillar + Cluster model. 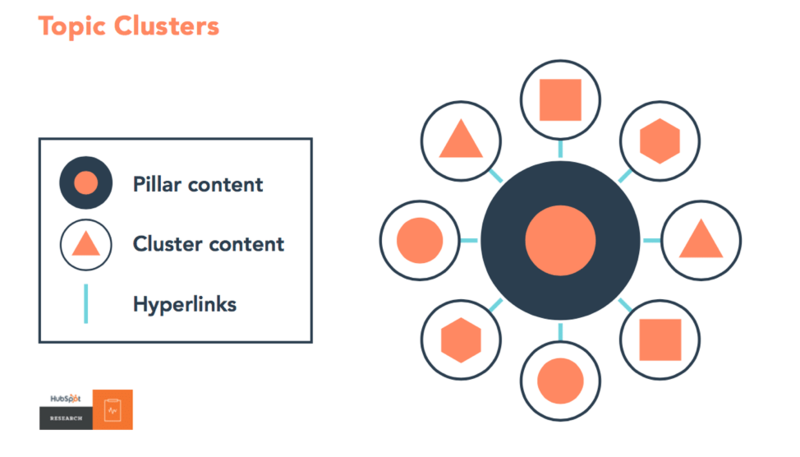 In plain English, your “pillar content” represents the big topic you want to rank for, and “cluster content” represents supporting content that relates to your big topic. Hyperlinking pages together shows Google they’re related to each other. We like to start backwards from our product and branch out from there. So, basically, what’s the end goal? Define that product page, and then come up with high traffic pillar page ideas that can support that. From there, break topic ideas off of your pillar page to create long tail blog posts. A good way to find long tail ideas is on Answer The Public. Soon, you’ll bring in tons of traffic, and then you’ll simply have to worry about converting that traffic into leads, users, demos…whatever your goal conversion is. This sounds easy, but it takes a lot of work. In fact, we’ll end by emphasizing the need to keep learning and improving. Make sure you have proper analytics in place, and continue to improve and optimize your inbound funnel. When it works, it really works. And when it really, really works, you can build a moat that is hard to compete with. Is your growing business interested in taking advantage of the power of video? Then you have come to the right place. This section discusses the importance of video marketing for small business, how to overcome hurdles in video marketing. It ends with ideas to consider for your own strategy. According to Forbes, 90% of consumers say videos help them with buying decisions. Sixty-four percent say that watching videos makes them more likely to purchase. Forbes also reports that businesses that use video in their marketing see a 41% increase in search traffic compared to those that don’t. Video has taken social media, and marketing in general, by storm. But for small business owners or marketers, it may feel daunting. Here at Animoto, we’ve spoken with countless small business owners that already wear a lot of hats. We know adding video to the mix may feel overwhelming—especially without the time, resources or technical expertise needed for video creation. Video affords marketers at businesses of all sizes a massive opportunity. We’ll take a quick look at what video can do for your marketing on social media, on YouTube, on your website, in your emails and even in your store or at an event. According to a recent Animoto survey, consumers rank video as their number one favorite type of content to see from brands on social media, and 93% of marketers using video on social media say it’s landed them a new customer. Video has become increasingly important on social media, where it generates 1200% more shares than images and text combined. Video can be incorporated into your social marketing throughout the customer journey to maximize the success of your campaigns. You’ve likely already heard that YouTube is the second largest search engine, after Google. What does this mean for you? More consumers than ever (including your own customers) search YouTube for product reviews, how-tos and more. Creating YouTube videos means that you’ll get in front of more customers searching for videos related to your industry and products or services. And guess what? These videos can also be repurposed to share on YouTube and social media. Including video in email can lead to an up to 19% increase in open rate and an up to 50% increase in click-through rate, according to Campaign Monitor. The even better news? Adding video to your emails isn’t as complicated as it may sound. In fact, the videos don’t actually have to play in your email. Rather, you can simply link out to them and mention “video” in your subject line to start seeing results. Video doesn’t have to be limited to the web. You can also use it for your in-person marketing—in your shop, at events and trade shows and in sales sessions. Loop a video on a screen to attract foot traffic or include videos to make presentations more engaging. Our recent survey on the State of Social Video Marketing showed that marketers aren’t making as many videos as they’d like. The reasons? They say video requires too much time and budget and the tools and software seem too complicated. As a small business owner, you likely face similar hurdles. We’ll break them down here and show you why video is easier to get started with than you may think. There’s a common misconception when it comes to video that it takes days (or even more) to create a single video. In truth, this may be accurate when it comes to professional productions with big production crews, designed to be run as television ad campaigns. However, creating videos for social, or to embed on your blog and website, doesn’t have to take a ton of time. You can get started with as little as a couple hours a week, and as you get better at making videos, you’ll need even less. You can repurpose photos and videos you already have or use stock imagery to save time on production. We’d also like to call out that even big brands with big budgets have started opting for less polished social videos for a more authentic look. You don’t have to spend hours to reap the benefits of video. But even with the time set aside, a lot of small businesses don’t use video because they believe they don’t have the expertise. Yes, some video editing softwares require advanced know-how. But a wide range of video editing solutions cater to non-professionals. And you can use these to create professional videos on your own. We promise you. We should also mention that, when it comes to social video especially, you don’t need heavy production. A lot of the most engaging videos are short clips with just a few shots, or even a single clip with text on it. Start simple and as you get more familiar with video creation you can try new, more complicated things. Finally, video production doesn’t have to break your budget. As we mentioned above, you likely have the photos and video clips you need to get started. If you don’t, you can use your smartphone instead of an expensive video camera. Add text over your video clips and you don’t need to worry about expensive audio equipment (85% of people watch with the sound off anyway). And you can tie it all together with an inexpensive, easy-to-use video editing tool. Okay, so now we’ve convinced you that you need video. But what types of videos should you make? This is one of the biggest questions faced by small business marketers looking to get started with video. We’ve rounded up some small business video ideas and examples for inspiration. And to help you out, each of these video examples includes a template that you can customize to make your own. Share the story behind your business. Who are you and what products or services do you offer? An About Us lets you show off the people and story behind your business, which can work especially well for small and growing businesses. A product video ad, which we’ll get to next, works when you want to close the deal and make a sale. But telling the story of your product or service can engage with potential customers on a whole other level. Telling the backstory of a specific product can make for share-worthy content, as you can see in this example. Do you offer a product with an interesting backstory? We promised a product video ad, and here it is. A video ad should be short and sweet. It introduces your product to the target audience and provides a clear call to action (CTA) so they know how they can purchase. Looking for a quick video idea for your social media pages? Try a quote. Quote videos take little time to make and rack up shares to boot. Just pair a nice photo or video clip with a quote that’s relevant to your business or industry. A how-to video lets you showcase your expertise. Answer a question you hear a lot from your customers or share an insider tip based on your industry expertise. Share it on social media and YouTube too, where potential customers are searching for answers. You can also share your expertise with a list or step-by-step instructional video. If you’ve got a blog or other content on your website, try creating a short video teaser to promote it. Make sure to include a clear call to action with the link where viewers can go to read more. With testimonial videos, you can share social proof and help new customers feel comfortable doing business with you. While you can actually shoot interviews with your customers to create testimonial videos, there are some easy alternatives too. Try using quotes from Yelp, social media or customer emails, paired with accolades and imagery of yourself or your product. We hope we’ve inspired you to start making videos. Before you dive in, here are a few tips to help you get the most out of your video marketing. Get started with what you have. You likely already have photos and video clips you can use to create your first videos. Look on your phone, your desktop, your website, and your social media profiles for content to get started with. Plan for sound off. When creating videos for social media, remember that 85% of people watch with the sound off. Use text to tell a story that translates whether or not viewers turn the sound on. Keep mobile in mind. More and more viewers watch videos on mobile devices,. Make text large enough to read and go for a square or vertical format for videos designed for mobile or social media. Target your video ads. With the targeting capabilities of Facebook Ads Manager and other social platforms, you can reach the audience most likely to engage with your business or product. One size doesn’t fit all. Creating a video for Facebook? For the Instagram feed? Twitter? An Instagram story? Different types of formats and content work best on different platforms, so plan your video content accordingly. Here’s a cheat sheet to help you out. Use your smartphone. You don’t need fancy equipment to get started. We’ve all got great professional cameras in our pockets. Your phone shoots better video than you think! Pay attention to lighting. Good light (or lack of it) can really make or break the quality of your video. Don’t have professional lighting equipment? Try shooting outside in the sunlight, next to a window or simply turn on as many lights as you’ve got indoors. Pay attention to audio. Similarly, the state of your audio can have a big impact on the quality of your video. When recording, listen with headphones to make sure everything sounds OK. And remember, even if you do plan on using audio you should plan for sound-off viewing and use text or captions. Ready to dive in? We’re here to help. Animoto provides everything small businesses and marketers need to drag and drop their way to powerful and professional videos. With customizable video templates, designed with success in mind, Animoto makes it easy for anyone to create their own videos in minutes. With over a decade in the industry and partnerships with Facebook, Instagram, YouTube, Twitter and LinkedIn, Animoto is used by more than one million businesses worldwide. We invite you to try it for free today. Happy video making! Email marketing is a must-have for business, but that doesn't mean it's easy to get right. In this section, Campaign Monitor discusses why email marketing is important for your small business, how to send amazing emails and, most importantly, how to scale your efforts. When you started your own business or started working at one, there were probably a few hats you were expected to wear—like creator, CEO, founder or visionary. But as your business grows, there will inevitably be a few more hats you have to put on—hats that may not fit quite as easily, like email marketing aficionado. At Campaign Monitor we want to empower you with email marketing tools and tips that are powerful yet simple, so you can get back to doing what you do best. There are over 3.7 billion email users in the world currently, which means the projected number of users by 2021 is 4.1 billion. Email marketing drives $44 for every $1 spent. 89% of marketers say email serves as their primary channel for lead generation. So you’ve decided to implement an email marketing strategy. Now what? First, you need to understand the purpose of email marketing: to create, secure and nurture relationships. Yes, you’ll likely meet other goals along the way, like increasing customer engagement and ROI, but don’t lose sight of the people whose inboxes you’re sending to. With this in mind, we’ve compiled a few tips for maximum success. What value can I offer subscribers? 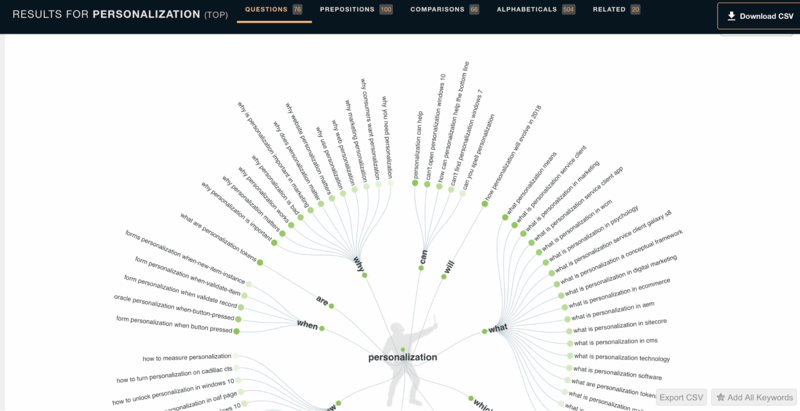 Once you’ve answered these questions, it’s time to map your customers’ journey. Think of this like mapping out a route for marathon runners; make sure the path is clear of barriers and the signs point the right way. You need to be familiar with the journey your customers take from lead to conversion so you can anticipate any needs or questions they will have along the way. When setting up your email subscription form, consider the information you’ll need long-term. Name and email address are the traditional fields, but collecting additional demographic information will help you to segment your audience into groups based on age, gender, location or another variable. Rather than send the same mass email to your entire list every time, segmentation allows you to send customized and relevant content that your subscribers will more likely engage with. After all, proper email list segmentation can double email open rates. Once you’ve divided your list into groups based on purchase history, interest or other variables, it’s time to create content specifically for the people in that group. Maybe something they indicated interest in has gone on sale, there’s an event happening in their area or you want to address them by name and recommend something they’ll love. One of our favorite ways to do this using Campaign Monitor is by inserting dynamic content into your message. This shows your audience that you understand and care for them, and it will add an extra “wow” factor that will surprise and delight them. And in case you needed additional convincing, MarketingSherpa’s research shows that open rates increase by 41% when a personalized subject line is used. So you’ve mapped out a plan, organized your list into segments and created personalized content that drives engagement. It’s time to take all the tools and tactics that work and scale them to reach more people. At this point, automation is your go-to. By scheduling emails to meet your subscribers at each point in their customer journey (which you already mapped out in step #1), you’ll continue to ensure that your content is relevant and fulfilling your customers’ needs. Plus, automated email messaging can increase open rates by 70.5%. You made it to the final step—see, that wasn’t so bad. The best way to continue to improve and refine your email marketing skills is to look at the data and find out what works, what you could do better and what you can live without. Keep an eye on your metrics, try to retarget the subscribers who don’t engage and maintain good deliverability to ensure long-term email marketing success. Seventy-seven percent of ROI comes from segmented, targeted and triggered campaigns, so find what works for you and continue to help it grow. When it comes to email marketing platforms, there are a lot of options to choose from and ideas to consider. We’ve given you tips and tricks to begin creating your email marketing strategy, but choosing the right provider can make or break your business growth. Of course, you’ll want to choose a provider that can grow with your business in terms of subscriber list size and functional capability, but what about features to enhance your segmentation, personalization and automation? If you’re looking for a service provider that will help you focus on your subscribers’ needs, design beautiful emails and scale your success, Campaign Monitor could be the perfect fit. With robust features for segmentation, personalization and automation, as well as 24/7 access to customer support, our team is here to help you drive engagement and increase ROI. Happy sending! Social media is a critical channel for growing your audience, showcasing your organization, and creating lasting relationships that will yield delighted customers. In this section, Sprout Social discusses the value of social for small business, how to get started on social and shares tips for advanced audiences. Sprout Social works with thousands of small businesses to help them improve their social marketing strategy while also saving time online. Over the course of working with so many organizations, we’ve gotten good at helping guide their social strategy. Here we’ve put together the essentials for small business marketing on social, but for a more comprehensive guide you can see our entire guide to social media for small business. Social is essential for driving your inbound marketing strategy, sharing your videos and increasing leads to email. But social media is also important on its own. 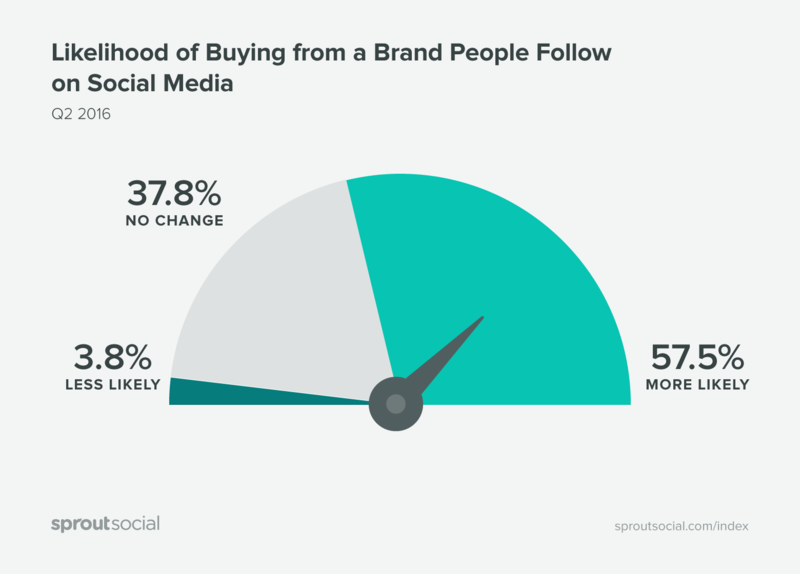 In fact, those individuals who follow you on your social channels are 57.5% more likely to buy from you. But it doesn’t stop there. 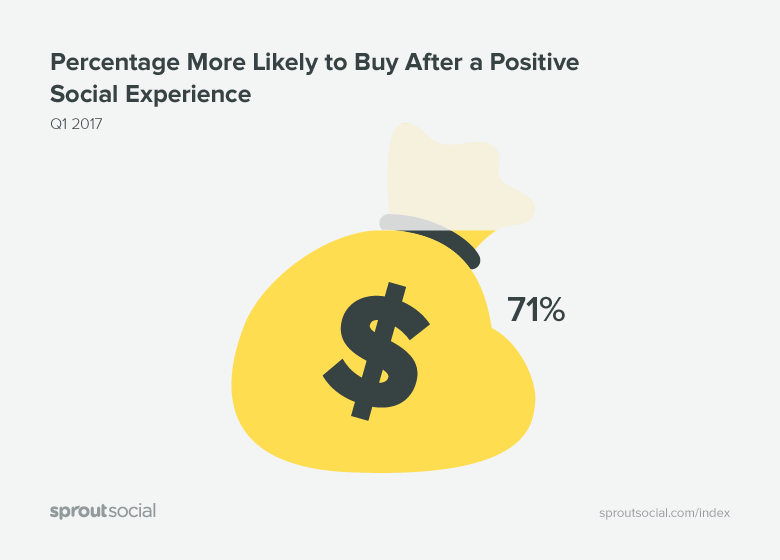 If you can actually manufacture a great positive social media experience that number increases to 71%. These numbers prove your brand should capitalize on the power of social media for small business marketing. We’ve broken the next sections down by where you may be in your social strategy, including information for those just getting started and more advanced tips for those with an established presence. If you don’t know what you want to accomplish on social media, then you’ll never know when you succeed or fall short. Without this, you’ll likely struggle to maintain a nimble strategy. Goals can vary wildly from one industry to the next. While a retail company may look for direct purchases from social, someone in higher education may look at new enrollment rates. Our recent Sprout Social Index asked social marketers about their biggest goals. You can use their responses to help you choose your initial social media goals, then refine those as you get a better sense of what social marketing can provide your business. We’ve included a cheat sheet to define each item below. Distribute content: Sharing your content to your social channels. Think of your social goals as the destination and your core metrics as the map that helps you get there. Once again, we’ve provided a cheat sheet to some key metrics for social media marketing below. Remember the more specific you can get, the better. This will enable you to create a strong social media marketing strategy around these individuals and take a targeted approach to reach the right people at the right time. Once you know who you want to reach, you’ll have to figure out where they are. Earlier in this guide, HubSpot noted that not every single inbound channel works for small business marketing. The same is true for specific social media networks—not every single one will make sense for your business. Social networks have varied user bases. Don’t invest in one network if your core audience is on another. Which platform best fits your B2B or B2C interactions? What’s the lifespan of your content? Are you engaging with user-generated content? Can you automate parts of your social media? The answers to those questions will inform the networks you should choose. To figure out what content to post, look no further than what has worked best in the past. If you’ve published to social media before, tools like Sprout Social, Twitter or Facebook Insights can help you understand what resonated most with your audience. Below is an example of how to view your Sent Messages with Sprout (available with a free trial). Sort your messages by your key metric and you’ll see the top posts for that metric. Look through a handful to find any consistencies and leverage that insight when choosing what to publish. Once you know what kind of content works, you can create social media posts to automatically publish at the times and days of your choosing. 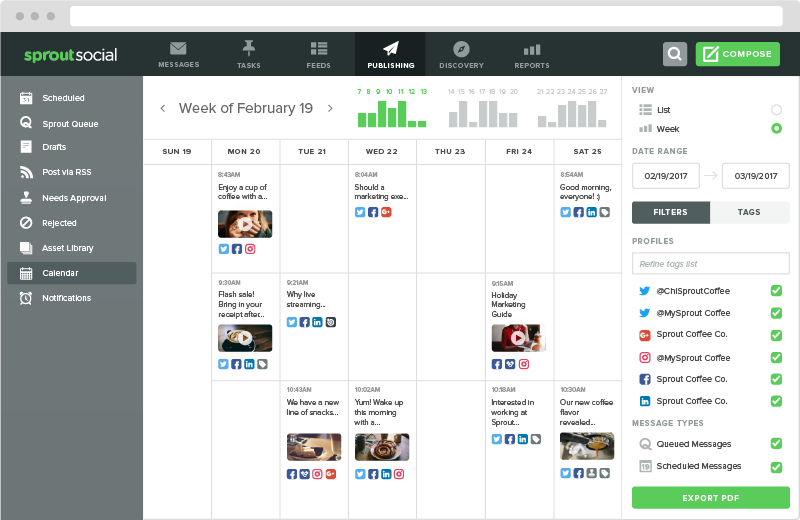 Additionally, you can use a social media publishing tool like Sprout Social to visualize your entire Publishing Calendar, across all of your networks and profiles. Automatically export your calendar as a PDF to share with other key stakeholders throughout your organization. Unless you sell the most niche product in the world, your customers likely post about it (and you) on social media. Whether they directly tag you or use certain keywords and phrases that relate to your company, it’s your job to respond to their messages to create a better user experience. Monitor your social channels for conversations or posts that warrant a response. You can use a social media engagement tool to pull in the conversations that directly mention you or mention something relevant to your organization. Once you’ve established the metrics that matter most to your brand, and spent time on social channels posting and engaging, you can start to track the impact of your efforts. The frequency with which you analyze your social media results will likely depend on your time and how much you utilize social. Remember that it’s important to track metrics to optimize your strategy. You can use a social media analytics tool to automatically run high-level or in-depth reports if your time is limited. We’ve established that small business marketers must respond to social media posts that tag or mention them. For a more advanced tactic, we suggest monitoring social media for conversations on topics related to your business, and then joining in. Here’s an example of how that can work. Let’s say you own a pizza restaurant in Chicago that prides itself on its gluten-free offering. 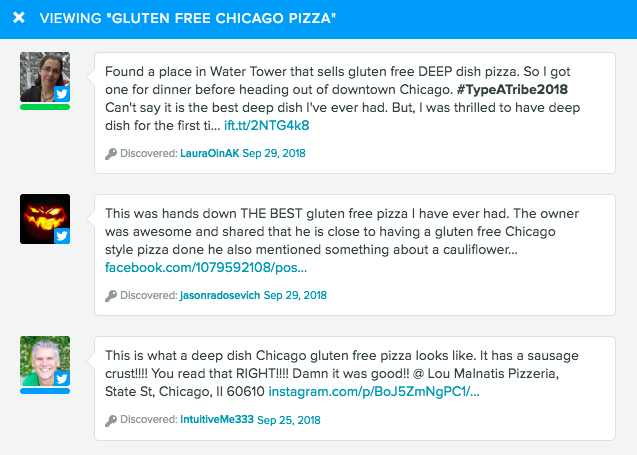 By using a social media listening tool, you can track everyone who mentions “gluten free pizza” in the Chicago area. These conversations will populate in your inbox in real time so that you can reach out to anyone looking for a recommendation and suggest your restaurant. Keep an eye on your competition’s social media strategy. Doing so will help you understand the industry and how you measure up as well as develop unique ideas to stand out from the crowd. We’ve created this entire guide on running a competitive analysis, including a free template to help you conduct your research. Hashtags help you get your content in front of new audiences on social media. Not sure which to use? 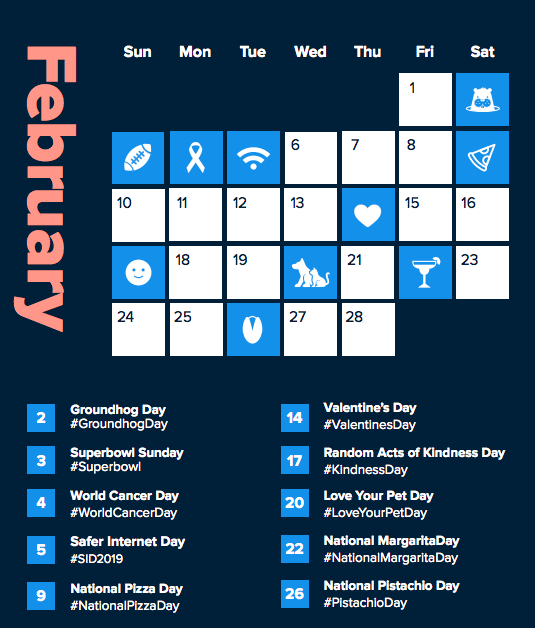 Our free Hashtag Holiday calendar contains a ton of ideas. Just make sure that the hashtags you use actually make sense for your brand and you’re not forcing it. They also shared some tips to make creating videos easier on your team. Now that you’ve bought in, make sure that you share any and all videos you create with their guidance on your relevant social channels. Social media poses so many opportunities for businesses that it can feel a little overwhelming at times. As a small business marketer, you may be in short supply of resources, but if there is anyone at your organization that can help you keep up, then invite them to join you. If your concern is in doubling efforts or reducing how secure your accounts are, then never fear. Social media collaboration tools can ensure that you effectively manage your presence as a team. If you don’t get the impressions you hoped for on social media, it could make sense to boost your views by putting some paid advertising dollars into your posts until your presence takes hold. Each native network has its own paid social functionality, or you can use a paid social tool to quickly boost your posts. A social media marketing tool like Sprout Social saves you countless hours managing your presence. Long gone are the days that you should find yourself manually logging in and out of each social profile when it’s time to publish a message, respond to customers or get your social media analytics. 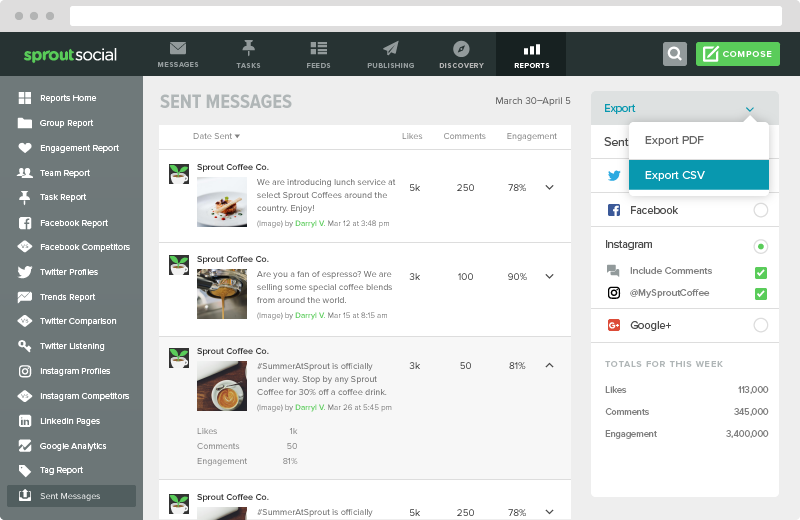 Learn all about Sprout Social for your small business and start a free 30-day trial today.